Again and again over the last several years, I've heard of people finding out that many of the 'orphans' in orphanages or up for adoption aren't really orphans. Watch this video to see what the Heaven's Family ministry is doing to reunite children with their families, and to prevent other children from being sent away in the first place. The link goes to a sermon from July 23, 2012, aimed at the household of faith. On the same website are links for more sermons from Blessed Hope Christian Fellowship, plus links to the websites of Charity Christian Fellowship, Ephrata Ministries, and Berne Christian Fellowship, where you can find more sermons and other resources for people serious about following Jesus. I couldn't get their Berne Christian Fellowship link to work this morning, so here's a link to their main page. The Duty of Charity to the Poor, Explained and Enforced, by Jonathan Edwards, from January 1732, presents a balanced view of the topic. And if you think you've got an excuse, my guess is that he'd already heard it, and has an answer for you. J. Warner Wallace notes that the early church was active, and powerful. In the 'nothing new under the sun' category, much of what we're seeing today among the utilitarian, and pro-choice, and 'it's better to be childless,' crowds is pretty much what was kicking around when Christianity came on the scene. When in Rome, do as the Romans do." So goes an old saying. But when the early Christians arrived in Rome from Jerusalem and parts of Asia Minor, they did not do as the pagan Romans did. They defied the entire system of Rome's morality. The low view of human life among the Romans was one of their pagan depravities: "The individual was regarded as of value only if he was a part of the political fabric and able to contribute to its uses, as though it were the end of his being to aggrandize the State. "1 Moreover, the pagan gods taught the people no morals, as St. Augustine, a former pagan himself, knew from personal experience (The City of God 2.4). This too did not enhance the value of human life. The low value of life among the Romans was a shocking affront to the early Christians, who came to Rome with an exalted view of human life. Like their Jewish ancestors, they saw human beings as the crown of God's creation; they believed that man was made in the image of God (Genesis 1:27). Although that image was tarnished by man's fall into sin, they nevertheless believed the words of the psalmist to be true: "You made him [man} a little lower than the heavenly beings and crowned him with glory and honor" (Psalm 8:5). They also knew that God so honored human life that he himself assumed it by becoming incarnate in the person of Jesus Christ, his only begotten Son (John 1:14). Thus, unlike the Romans, Christians did not hold human life to be cheap and expendable. It was to be honored and protected at all costs, regardless of its form or quality. By doing so, they countered many depravities that depreciated human life. Read the rest of the excerpt: The Sanctification of Human Life, at Issues, Etc. It covers a wide range of topics, including, but not limited to, infanticide, abandonment, abortion, gladiatorial shows, branding of slaves, and human sacrifice. ​Update: The author released what appears to be a revised or expanded edition, under a new title. Unlike the book linked above, How Christianity Changed the World is still in print: in paperback, ebook, and audio. 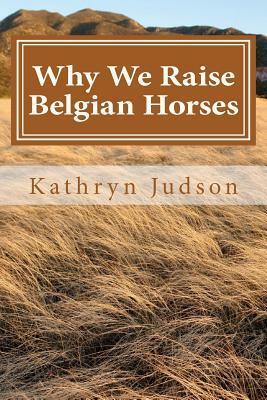 This is the last call for the Goodreads Giveaway of the original trade paperback edition of Why We Raise Belgian Horses. Goodreads will close entries tonight, and send me the winner's name in the morning. ​This giveaway is open to USA addresses only. Giveaway ends October 03, 2017. Here's more on Anabaptists who turned parts of Europe upside down a few centuries ago.